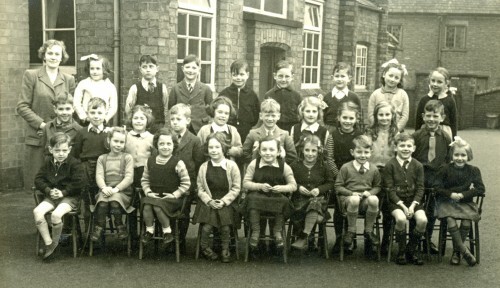 Back row, left to right: Teacher probably Miss Bradshaw, then, probably Denise Gretton, ?, ?, John Commons, ?, Roger Sutton, Valerie Dowding, could be Caroline Hetherington. Middle row, left to right: Keith Penny, ?, ?, ?, Monica Patrick, Keith Perry, Gloden Horbury, ?, Pat Halford, John Stirling. Missing information: Can you provide any of the missing or uncertain names?